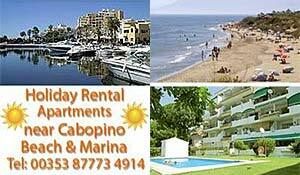 2 and 3 bedroom apartments near Cabopino beach. Swimming pool, Sat TV, wi-fi. Rent direct from owners. Pictures and details of the accommodation in our holiday rental apartments near Calahonda and Puerto Cabopino on the Costa del Sol can be viewed by clicking the links below. We have three self catering apartments for rent in Artola Gardens; two have three bedrooms and are next door to each other on the 4th (top) floor and the other one has two bedrooms, and is on the ground floor. Please click on the links below to see photos of the accommodation in the Artola Gardens apartments. In all our rental apartments, beds are made on your arrival and all bed linen and towels are supplied. Fresh bed linen and towels are supplied weekly during your stay. broadband internet access included in the rental price. with double balcony overlooking pool with view over the Mediterranean. with gated terrace opening onto the lawn where the pool is located. Details of facilities in Hotel Artola, adjacent to Artola Gardens, nearby attractions and also Puerto Cabopino beach and marina can be found here. Video of views of Cabopino beach and marina, within easy walking distance of the Artola Gardens apartments. 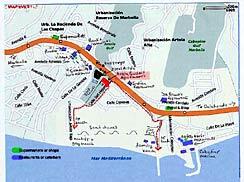 Please also view the PDF file of photos of the Puerto Cabopino area showing beach and marina areas. 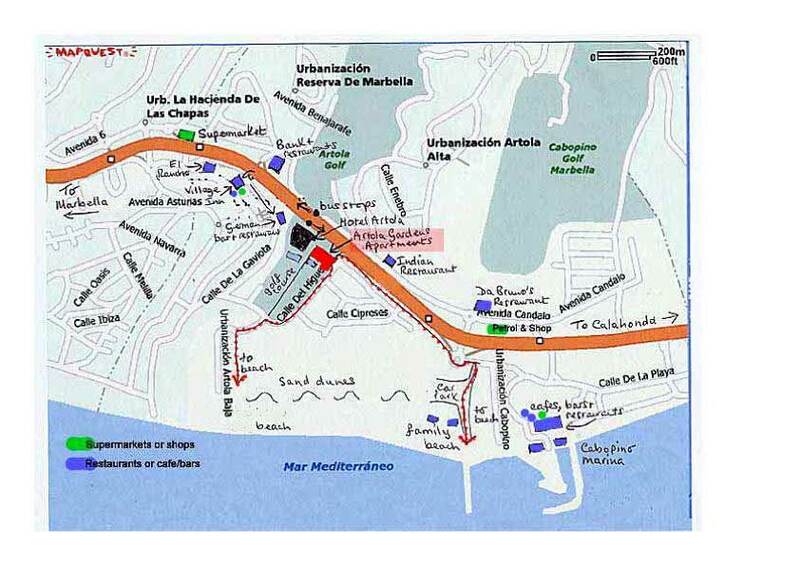 Click the small map below to see a larger map of the Cabopino area showing the location of the Artola Gardens apartments and the two ways to walk to the beach at Artola and Cabopino (less than 10 minutes walk). A taxi or car hire vehicle can be pre-arranged to meet you at Malaga airport, also golfing packages can be tailored to suit your requirements, please enquire. On arrival at the apartment, you will be met by our caretaker and you will find complimentary basic provisions, typically tea, coffee, milk, sugar, bread, butter, and mineral water. The bus stop for the local Portillo bus service which runs from Fuengirola to Marbella is just outside the Hotel and runs every 35 minutes. Plaza Monica is 2 minute's walk up the road. 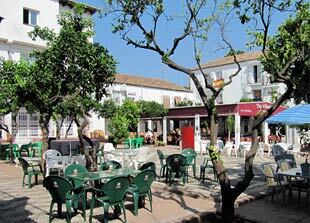 Here you will find a minimarket, general shop, The Orange Tree Bar and The Village Inn Restaurant (recommended). Free flamenco shows twice a week during the summer.. Within 5 minutes walk there are local bars and restaurants including Chinese and Italian, late night supermaket with in-store bakery, minimarket and a Bank. There is a hairdresser and pharmacy in the Artola apartment block itself. Recommended local restaurants include The Village Inn - an outdoor barbecue restaurant in Plaza Monica, and El Rancho - excellent steak restaurant with an authentic spanish atmosphere. Please see our attractions page for details of many of the visitor attractions for all the family and places to visit along the Costa del Sol. Our nearest beach is less than 10 minute's walk at Puerto Cabopino, where there is a beautiful marina with good restaurants and beach cafes, including Albert's and Harbour Lights. Please phone the owners on: 00 353 87 7734 914 for any further enquiries.